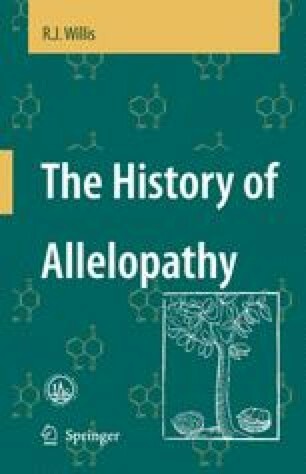 Interest in allelopathy in the first half of the nineteenth century has been linked primarily to one man, Augustin Pyramus de Candolle (Willis 1996, 2002). A.P. de Candolle (1778-1841; Figure 7.1) was born in Geneva into a moderately affluent Protestant family. At the age of seven, he was stricken with hydrocephalus, but survived seemingly with no ill affects. He became fluent in Latin while at school, and seemed destined for a literary career. The revolutionary fervour in France spread to the republic of Geneva, and de Candolle’s family, being both Protestant and of privileged position, was forced to seek refuge during 1792-4 in Vaud on the shores of Lac Neuchâtel. This period was undoubtedly important for de Candolle’s health, and for the development of his lifelong love of botany.